The village of Haydon Bridge sits 5 miles south of Hadrian's Wall, and within 15 minutes of Vindolanda, Housesteads, Chesters Roman Fort, Steel Rigg and The Sill; all of the key visitor attractions. 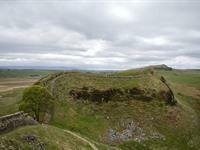 The village provides an ideal base to explore Hadrian's Wall country, with easy access to all of the sites and a good evening base for meals and a nice relaxed sleep. Access to the A69 main road, the local rail network and the service buses also gives quick and easy access to Corbridge Roman Settlement, Walltown Roman Army Museum, and Birdoswald Roman Fort. Shaftoe's provides the ideal base from which to see any or all of these sites and to walk the wall. We are always happy to advise on good walking routes, plans for the day and assist with your travel arrangements, be you travelling on foot, by bicycle or car. 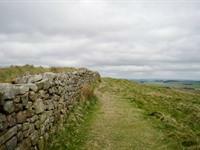 Shaftoe's provides a great location for a stop-off if you are walking Hadrian's wall. If you are looking to walk the full 84 miles of the coast to coast route, we sit at the mid-way point. If you are interested in staying with us on your walk across the top of England then give us a ring and we'll see what we can do to not only provide you with a nice warm bed for the night, plus a hot cooked breakfast, but also a washer and dryer for those wet clothes. We can also help with a packed lunch and help with setting off in the morning. If you are travelling light, then why not have your luggage transferred from your overnight accommodation by one of the local luggage transport companies (see our resources page for help). Shaftoe's is always very pleased to play host to those amazing people who volunteer as part of the excavation team at Vindolanda during the Spring, Summer and early Autumn. If you are considering staying at Shaftoe's for your two week "break", then please give us a call and we can discuss your needs and the costs involved in staying at Shaftoe's for this extended period.